Referee Craig Thomson flashed three red cards after ugly scenes at the final whistle. Rangers' Bilel Mohsni and Motherwell duo Lee Erwin and Fraser Kerr were sent off after a brawl at the end of the Scottish Premiership Play-Off final. 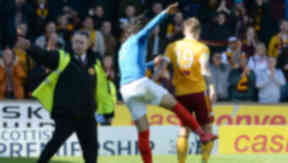 Erwin and Mohsni clashed just after the final whistle in the wake of Motherwell's 6-1 aggregate win, which sees the Steelmen maintain their place in the country's top flight. Kerr, who was an unused substitute, also got involved as the trio were shown red cards. 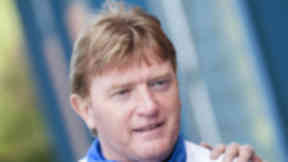 Striker Erwin attempted to shake hands with Ibrox defender Mohsni before shoving the 27-year-old. Mohsni then lashed out, punching and kicking the young forward and leaving him with blood on his face. Players from both sides rushed in with stewards trying to restore order at Fir Park. Goals from Marvin Johnson, Lionel Ainsworth and a penalty from John Sutton gave Motherwell a 3-0 win in the second leg.